The side effects of smoking are well documented and widely known. Yet the World Health Organization estimates that nearly 1 in 3 adults still smoke cigarettes, despite mountains of research that link smoking with lung cancer, emphysema, and heart disease. The prevalence of smoking gives rise to another public health concern: Secondhand smoke. Because exhalations contain carbon dioxide in addition to the carcinogens and toxins of the original cigarette, health experts say exposure to secondhand smoke can be more dangerous than smoking firsthand. 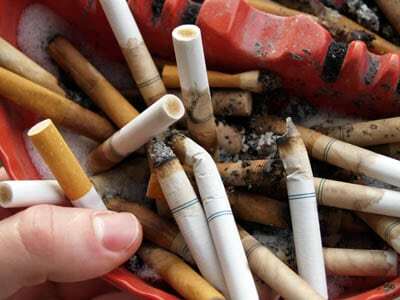 Now, a new study has found secondhand smoke to be among the most critical factors causing the rise in dental caries (cavities) among children. Inflammation: Secondhand smoke may cause inflammation of the oral membrane. Decreased vitamin C levels: Researchers also believe secondhand smoke may deplete vitamin C levels, causing a corresponding decrease in overall immunity. This leaves the mouth vulnerable to bacterial infestation and growth. Impaired salivary gland function: Secondhand smoke may also damage salivary gland function in children, which can restrict natural re-mineralization of tooth enamel. Over time, tooth enamel degrades and becomes increasingly susceptible to decay. Increased levels of Streptococcus mutans (S. mutans). According to researchers, impaired salivary gland function may also increase oral populations of S. mutans. Along with other bacteria, S. mutans produce acid when sugar is consumed. Larger cultures of S. mutans means more acid production, which ultimately accelerates the erosion of tooth enamel. To learn more about our patient-focused approach to oral healthcare and total body wellness, visit the following page on holistic dentistry. Readers may contact our office online, or call to schedule an appointment at 305-274-0047.